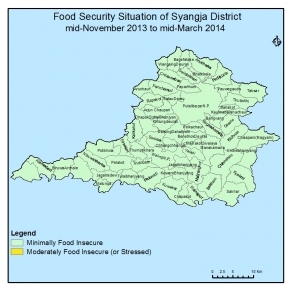 The overall Food Security situation is normal. All 60 VDCs and 2 municipalities of the district are in minimally food insecure phase in this cycle. Maize, paddy and millet are the main summer crop of the district. Maize had already harvested, paddy and millet are harvesting and the production is normal.The hhs food stock is sufficient for 4-6 month from their production and income.Income from cash crop like vegetables, Zinger, maize seed and animal products and their sale was good ( 69 Crore 53 Lakh) with high price as compared to baseline. Employment opportunities from some agriculture & construction works are reportedly available.There was sufficient food stock in the market to fulfill the demand and the price of main staples were also normal(increased by 9.55 percent ) as compared to last year.Estimated inflow of remittance is increased by 20% ( Rs 2.Arab 88 Crore) as compared to last cycle due to major festivals in the cycle.The rate of malnutrition is 0.14% and wasting is 0.12% in the cycle.There was no siginificat natural disaster causing food loss and civil security was normal during this cycle.Peopleusing the traditional coping strategy. The food security situation of the Cluster will remain the same as Minimally Food Insecure. HH food stock will be sufficient for more than 4 months from the stock of previous harvest and good purchasing capacity. Cash crop(orange/ vegetable) and livestock products sell will be continued. Similarly there will be income from remittance and employment opportunity will also be available from agriculture operation, private construction and development activities. Market price of main staples in key markets may remain stable due to good road access and availability of food from summer harvested crop. Market stock will be sufficient. Civil security will be normal due to completion of Constitutional election.